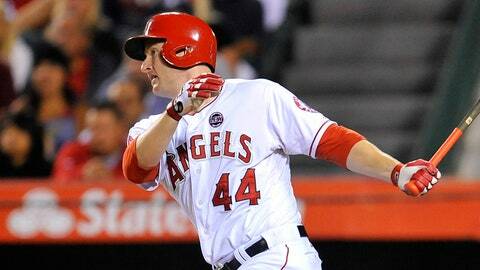 Mark Trumbo hit a career-high 34 homers last season. A little trade isn’t going to stop Mark Trumbo from celebrating an annual tradition. Trumbo was traded by the Angels to the Diamondbacks on Dec. 10, but the deal didn’t stop the slugger from taking part in the Angels’ annual Children’s Holiday Party at the ESPN Zone in Downtown Disney. The 27-year-old has attended the event since his days in the Los Angeles minor league system, so he asked the club’s public relations department if he could still participate this year despite being shipped to Arizona a day prior. "I did expect it to be maybe a tad strange, but then again, it would only be the adults that would probably find it a little bit strange, because the kids are just happy to be there," Trumbo told MLB.com’s Alden Gonzalez. "It was cool. It was a little strange not putting the uniform on, but it was good nonetheless. I went in with an open mind, hoping for a good experience, and that’s exactly how it turned out." Trumbo, wearing a plaid shirt this time around rather than an Angels jersey, reportedly read Christmas stories, signed autographs and gave high-fives to 200 or so under-served children from the L.A. area. It was a fitting goodbye for a kid who grew up just down the road. "Standing at home plate at the end of last year, I didn’t know that would be my last at-bat in the foreseeable future as an Angel," Trumbo told Gonzalez. "You just never know. But this is something I had control over, I guess. I felt like the right thing to do would be to go, to sign some autographs and say hi to the kids and say hi to all the other guys who were going and kind of do one last thing to say thanks for the opportunity that I got in Anaheim." Trumbo played in parts of four seasons with the Angels and demonstrated plenty of power. He compiled a career-high 34 homers and 100 RBIs in 2013. Los Angeles was in the market for pitching, though, and the easiest way for the Angels to obtain the young arms that they coveted was to trade Trumbo this offseason. The Halos landed lefties Tyler Skaggs and Hector Santiago in their deal with the D-Backs. Next offseason, Trumbo might spread holiday cheer at an Arizona Christmas party. But for one more day this December, Trumbo was the hometown kid giving back to the Los Angeles community.